Choosing the best dog food for your pet can be a very tricky business. With so much controversy surrounding pet food industry, it seems easier to just pass the buck, and let somebody else tell you what to do. That's why many of us consult with vets. We assume that a veterinarian will prescribe the best and “right” prescription dog food diet for our dogs that will offer a balanced diet. It might surprise you to know that many vets only have the very basic education in animal nutrition. Many veterinarians refrain from staying up to date with the most recent research in animal nutrition, or may not have your pet’s best interest at heart. In truth, prescription dog food has a very high mark up, so selling it is easy money for any veterinarian. Obviously, this is not to say that it's what every vet is up to. It is pet owners' responsibility to educate themselves about proper dog nutrition or seek the advice of a trained canine nutritionist. In some instances, prescription dog food diets are the right choice, but there are also things you need to know about these foods. There are times when your dog will need a significant change in his diet, whether due to allergies, new or older health conditions, sensitive stomach or other reasons. If you (and your pet) are in this position, start by looking into both veterinary products and over the counter solutions of different dog food diets before deciding what's right for you and your dog. Do your own research using your vet’s diagnosis as a starting point. There's a lot of misinformation floating around the internet about pet nutrition. Research, learning and understanding is key to avoid being duped into something you don't need. The reality is that even though prescription dog food diets will often be advised by your vet for many of the below listed illnesses, more often than not, you don't need to buy these expensive dog food brands, and I'll explain why. Obviously, prescription veterinary dog foods are only available from veterinarians. Prescription dog food manufacturers are regulated by a patchwork of individual state feed control officials, under the FDA’s Center for Veterinary Medicine. Other labeling standards are set by the Association of American Feed Control Officials (AAFCO), for both prescription pet food diets and over the counter products. If a product says it can prevent or treat a disease, research to prove it should be submitted to the Center for Veterinary Medicine (CVM) under the Food and Drug Administration (FDA). Sadly, many dog foods simply use more general terms to get around that, saying they support and promote good health in dogs rather than making specific medical claims. Pet owners, in the meantime, assume this will help their dogs with specific disease, which is very often not the case. The bottom line is to be vigilant and read those labels closely, and do the research. Jennifer has done some extensive research in this article to expose how closely related veterinary clinics and vets are to pet food manufacturers, and how they work together. It's important to be aware that your veterinarian may have a vested interest in getting you to buy prescription dog food diets at their clinic. READ ALSO: The Best Dog Food for the Money – Which Brands Are Worth Their Price Tag? Since the 1980's, pet food sales have bumped their profits significantly. The trend peaked between 2000-2005, as the cost of pet food continued to rise more than 30 percent, stalling sales, pushing pet food manufacturers to become even more involved in veterinary care to stay in the loop. It's extremely important for us to voice our concern over this and remain skeptical. Some large pet goods retailers in the USA own certain veterinary chains. This makes vet hospitals the largest veterinary chains in the country. According to Banfield Pet Hospital, Mars is the owner of Banfield Pet Hospital and Blue Pearl under its veterinary health division—separate from its pet care division that includes prescription and over-the-counter pet food (source). As these multinationals are showing the way to higher profits, other pet food conglomerates are following their example and buying up veterinary clinics too. Due to the incestuous nature of the prescription dog food business, it is easy to falsely promote its use, and control its price. The plaintiffs in the class action lawsuit want restitution, treble damages, and to stop how the defendants market their prescription pet food diets. Another bone of contention is that prescription dog food diets (as well as cat foods) shouldn't need a prescription at all, since they contain no special drugs, controlled substances, or unique ingredients, compared to over the counter products. Many aren’t even evaluated by the FDA. Since the product comes with a prescription, most pet owners assume it will treat and prevent health problems better than what’s available over the counter. Many dog owners also fear the consequences for not following their veterinarian's advice, giving the products what’s argued as an unfair advantage. A lot of pet food manufacturers have been in hot water over the last few years. PetSmart has a separate and unrelated class action lawsuit against them because their receipts show that prescription pet food are non-taxable, but tax is still charged. Plaintiffs want sustained monetary compensation, court costs, and further relief from the court but looking at the history of how these things turn out, it doesn't look good for the pet owners either way. Did you know that what you read on the label of your dog's food isn't always the truth? Both prescription dog food brands and over the counter pet food can be contaminated with ingredients not on the label, and the FDA doesn't seem to have an issue with that. For example, the Journal of Animal Physiology and Animal Nutrition published a study in 2011 where three of the four soy-free, venison pet foods they tested had soy in them. One pet food product had unlisted beef in it as well. A product’s price and the quality of its ingredients don’t always follow each other like consumers might expect. Some special over the counter and prescription dog food brands, particularly allergen-free and limited ingredient formulas, use hydrolyzed meat. This is also known as feather meal. The feathers and other meat-by-products are broken down into basic amino acids under very high heat, and then “palletizers” are added to make it taste more attractive. The theory behind this is that some pets are sensitive to certain kinds of intact animal protein, but such problems are often caused by the poor quality protein and other ingredients in many pet foods in the first place. The digestibility of the resulting amino acids are not the same as the bioavailability of the essential nutrients, though. Along with other ingredients not natural for our pet’s bodies, like corn, wheat, soy, potato and other starches, the resulting products are not biologically appropriate or nourishing, according to some experts. They create waste products in the blood that the kidneys and liver have to deal with. Dogs and cats fed too much, or only dry pet food are dehydrated at a low-level, all the time too. That’s hard on their organs and results in many diseases in dogs. RECOMMENDED: How Commercial Dog Food is Made? Let's cover a few most common disease and health issues in dogs, and when prescription dog food is often advised for these illnesses (and how you can pick alternative or even better dog food brands that are not the expensive prescription dog food diets). Dogs with kidney disease and renal failure required a very specific dog food diet. Prescription dog food diets for kidney and heart diseases are common solutions prescribed by veterinarians, as well as some weight loss and senior dog food formulas. But expensive prescription dog foods aren't the only way to go in this case. The safest option for dogs with renal problems are high quality foods with moderate to low levels of protein. These foods must also have little to no phosphorus and sodium. There are plenty of low-protein dog foods that fit well and will not cost you an arm and a leg. Homemade dog food (specifically designed for dogs with kidney problems) may also be a great treatment, although it often turns out to be more expensive than store brands. Many dog breeds are very susceptible to allergies and gastrointestinal diseases. As a result of these diseases, symptoms in dogs may include skin problems, allergies, intolerances, or gastrointestinal issues. Once you see these symptoms and visit your veterinarian, you'll be advised prescription dog food, but you don't actually need it. To fight this, look for limited ingredient dog foods and novel protein formulas. Hydrolyzed protein dog diets are a common solution for this, but a controversial one. Moderate or low levels of fat and soluble fiber are often recommended for dogs with these problems; however, some pets may need more fiber, not less. There are special products for Inflammatory Bowel Disease, but trial and error is often needed to find the right diet. 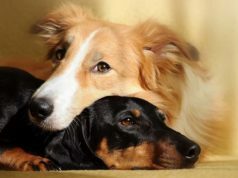 Canine arthritis is a disease that most dog owners fear as their pet ages. Fortunately, there are ways to prevent it or at least alleviate the symptoms using proper diet. One proven way is giving fish oil for dogs. Fish oil contains omega-3 fatty acids (EPA and DHA), which have been shown in clinical trials to be extremely effective against canine arthritis and joint problems (source). Some supplements for dogs with arthritis will also contain glucosamine, chondroitin sulfate and vitamins, all of which the key ingredients to an overall healthy diet for dogs. New Zealand's green-lipped mussels are popular too for their glycosaminoglycans. But when it comes to prescription dog food, it's a little different. But glucosamine and chondroitin levels in prescription dog food diets are usually so low, they may have little or no effect whatsoever (source), and therefore it's a waste of money. Furthermore, they've never even been approved by either the FDA or AAFCO as pet food ingredients because there isn't enough scientific evidence that they prevent or treat joint issues or arthritis in cats and dogs. The dose is also difficult to control if your pet doesn’t always finish his food. Obesity and weight problems in dogs are becoming increasingly common in the US. But choosing costly weight loss prescription dog food diet isn't your only option. What you need to know is that the key to weight loss in dogs without starving them is choosing the right type of nutrients that will keep them full and satisfied. Higher fiber will always make dogs (as well as humans) feel more full without more calories. Between 200-300 calories per cup is common. It also slows down digestion which is great for maintaining steady blood glucose levels. In addition, some dogs' weight will improve with high protein diets that are very low in carbohydrates. This will require some thinking and calculating on your part, and if you're not up for it, then there are prescription dog food formulas made specifically for dogs with diabetes as well as glucose control. I have written before on why you must always consider the age of your dog before you pick the right type of diet. Senior dogs will need specific nutrition to keep them healthy. As indicated above, fish oil will be extremely beneficial to senior dogs. Not only omega-3s help with joints and arthritis for older dogs, but these fatty acids and antioxidants support dog's brain health and many other functions in the body. Low fat and calorie recipes are usually advised for older dogs, but not all senior pets are overweight, thus some may need the opposite. Many of these types of prescription dog foods will include glucosamine and chondroitin sulfate for the joints too, but remember what I said about these additives above (i.e. they may not necessarily work). Problems with urinary tract disease and kidney stones are less prevalent, but they're still around and you should know how to change your pet's diet if you encounter this. Wet dog food is the absolute best choice in these cases due to higher level of liquids. Canned dog food will dilute the urine better than kibble. Prescription dog food is specific to the type of minerals found in an urinalysis or the stones. Over the counter solutions for these issues are rare, so in this case, prescription brands may be the way to go. This is another issue that senior dogs are more likely to have, but not all veterinarian recommended prescription dog food diets will work to deal with this. Kidney, and geriatric prescription diets are sometimes recommended, as well as dog heart disease specific products. Low sodium is the common factor in these dog food recipes, but there isn't a lot of scientific evidence proving its benefits for hypertension in dogs. Its effects are even doubtful when it comes to human blood pressure, other than in rare individuals sensitive to sodium (source). Taurine and Carnitine are two ingredients with possible (but still unproven) benefits for heart disease in dogs, as well as fish oil with omega-3 fatty acids. My contention in this article is definitely not that veterinarians aren’t important partners in the treatment and prevention of health problems of our dogs. You should never try to diagnose issues yourself, no matter how tempting that is with the ease of use of the Internet. But, since it is a partnership, you need to do your part. Always read dog food labels, then talk to your vet about anything you don’t understand, especially in the ingredients. Ask them specific questions and to address your concerns. Your veterinarian's responses will tell you a lot about how much they know about canine nutrition and the product they are recommending for your dog. Outstanding and settled lawsuits against the parent company or those who make that specific brand of dog food. If your pet’s health doesn’t improve after a few weeks, it might not be the right product for him. He might do better with supplements or a different approach. Every pet is different, and it might take some trial and error to find the best way to help your dog. Never feel you’re limited to the products available from your specific veterinarian. There’s a lot of health products for dogs out there, and the numbers are growing all the time. Most importantly, if you don't see any positive changes and your veterinarian does not address that, go to a different vet clinic or find a better professional. Previous articleAre Bully Sticks Good for Dogs?